This occasional series features Eastern Mennonite University staff members. Read Staff Spotlight #1 about Lynn Veurink and Staff Spotlight #2 about Vanessa Derrow. 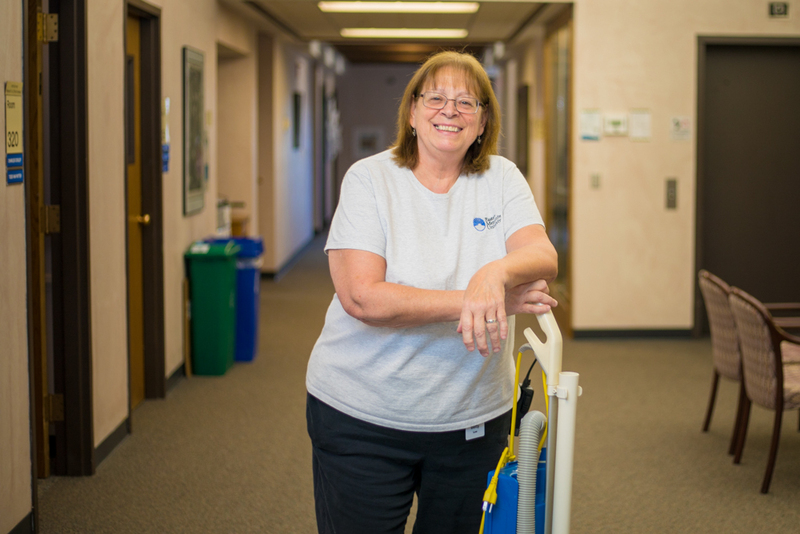 Betty Lee, a lead custodian for facilities management, grew up in Dayton, Virginia, and lives with her husband Steve in Clover Hill. 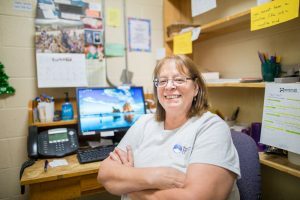 Betty and her team are responsible for the west side of campus. They maintain the Seminary, Campus Center, Northlawn, Roselawn, Hillside and three houses on campus. Betty Lee in her Campus Center office. My given name is Betty, but my nickname is Bette, like Bette Midler. In school everyone called me “Betty,” but at home everybody called me “Bette.” My father wanted to name me after his Aunt Betty, and my mother wanted to name me after Bette Davis. Mother said they always mispronounced Bette Davis’s name “Betty,” but that her name was “Bette.” So mother wanted to name me “Bette,” but they named me Betty and called me “Bette.” It’s very confusing. I graduated from Turner Ashby High School in 1972, and actually worked for my father. He owned a grocery store in Dayton on Main Street called “Bernard’s Grocery,” and a distributing business. I drove a one-and-a-half-ton refrigerated truck and sold hot dogs, the cheese that’s in the wooden crates, and baloney-cloth baloney that was literally in cloth, back in the day, and I used to drive all over. I went to these small, little grocery stores in Elkton and Shenandoah, and sold my products. My husband Steve and I were dating at the time, and he used to call it the baloney truck. He had to teach me to drive it because I didn’t know how to shift gears. It was quite the experience. Then I got a job at Metro Pants, a factory in Bridgewater. I worked there for probably ten years, at a sewing machine that sewed the outside side seam of the pants. It had a knife on it to cut the threads, and then a needle to sew, and you had to pay attention, so you wouldn’t get your fingers cut off. You had to go fast, because it was piece rate; you got paid for the amount that you produced. After careers at Massanetta Springs Conference Center and as a seamstress, Betty Lee was hired to work in facilities management by now-retired supervisor Evie King. What was your path to working at EMU? I was working part-time at Massanetta Springs Conference Center, and I wanted a full-time job. I happened to see the advertisement in the paper for custodians at EMU, so I applied and – luckily – got the job. Yes, she did – and so luckily I got a job here. This year Steve and I will be married 36 years. We have one son Alex, who is married to Samantha and lives in Bridgewater. They have two children – Cash is nine and Vivian’s three – and they come up every Sunday for supper because they want to make sure that we always see the grandchildren at least once a week. I think it’s nice that they put forth that effort to make sure that we see the grandchildren. Steve is retired. He worked for 30 years at Merck, and now he babysits our granddaughter on Wednesdays, so he’s lucky in that way. I try to get home in time to see her, but sometimes she leaves before I get there. I try to hit that recliner as much as possible. That’s my favorite spot: the recliner. But we have a big yard and a lot of flowers, and my husband has a vegetable garden. I call it “his garden” because he’s very particular and it’s his baby, so I don’t really go in it. But I help with the flower beds and the yard work. We enjoy being outside. And finally: Which of the following about Betty is a lie? I love chocolate, any kind. Chocolate is chocolate. I exercise – aqua aerobics – three days a week after work. I do not color my hair. So glad Evie “overruled” me. Bette is one of the best team players and leaders I’ve ever worked with. Wishing you all the best in retirement! Betty/Bette—I always knew you as Betty. I’m thrilled you are being recognized for all the good you brought to EMU. It was a joy to meet up with you in the suite first thing in the morning. You were a good start to the day. Keep smiling and laughing–it’s your trademark! Loved reading your story Betty!! It’s a pleasure to see you around campus and be greeted with a smile or a good laugh :) My momma worked at Metro for a while too. Glad Evie stood up for ya sister. Thanks so much for all you do! Thank you for your fun loving, gracious spirit! Thank you for making work fun for my daughter when she was on your team! Thank you for welcoming me every time I journey to main campus! What great memories! I can almost hear Betty saying some of this! I can’t think of anyone that deserves to be featured as much as Betty! She was a fabulous boss. As someone who works in the Seminary Building, your hard work is very evident here. Thank you for our very clean building! You and your Facilities Management team are very much appreciated! You have been making me laugh out loud since we sat near each other in Vera Hollen’s Home Ec class cutting dress patterns out of “kettle cloth.” I treasure your friendship and look forward to all our future laughs and stories. Thanks for all you do and for the many ways you brighten the days of colleagues and students. What a great story! I learned a lot about Betty and about Dayton! I truly appreciate all the hard work she and her team accomplish in the Campus Center. Well done! The woman, The myth, The legend! Amazing person to be around glad this piece was written because you deserve to be known around campus. Betty, Your greeting was the highlight of every day that I worked in the Campus Center Third Floor. Your Great Spirit brings lots of energy to many. Thanks! Congratulations Betty! I enjoyed reading your story and your journey to working at EMU. Thanks for your dedication and leadership. Great story. I do know one thing….you like chocolate! So that is not a lie. Glad you are part of our team. We love you Betty and are so grateful for who you are and all you do on our behalf! Betty, feel free to help yourself to the chocolate on my table any time! Great to read your story, Betty. And thanks for your many years of service to EMU. You bring brightness to the administrative suite and everywhere you go! Betty, one of my favorite things about you is that you can whistle like a song bird! I love coming in early some days to the sound of your sweet whistle. Thanks for sharing your many gifts with EMU. Betty, It was great seeing your smiling face. A great article of a deserving person. It was good working with you. Great article! I have gotten to know Betty over the years. She is always jovial and has a great sense of humor. Her generosity has not only been seen in this community but in other parts of the world. She is truly amazing! What a great article about a very special friend. I really enjoyed all the years you were at EMU while I was there. All the laughs and interesting conversations we had I will always cherish. Enjoy those grandchildren and thanks for being a wonderful friend! !